July 16, 2007 issue - As for so many of us, the genocide in Darfur was merely an abstraction to Ashok Gadgil, a scientist at the Lawrence Berkeley National Laboratory in California. But in September 2004 he got a call from the U.S. Agency for International Development. Could Gadgil design a screw press for Darfurians, the caller asked, so they could turn their garbage into biofuel pellets? "I quickly showed him that there is not enough kitchen waste in home cooking to produce much worthwhile fuel," the physicist says, and USAID dropped the idea. But the problem continued to nag at him. 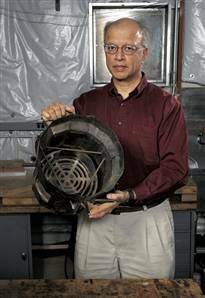 Eventually Gadgil decided that if he couldn't redesign the fuel, he would redesign the stove.